50th Anniversary Hand-Numbered Limited Audiophile Edition! Fold-out packaging with restored original lenticular cover art! To commemorate the 50th anniversary of The Rolling Stones album Their Satanic Majesties Request, ABKCO Music is releasing a limited edition deluxe double vinyl/double hybrid Super Audio CD (compatible with all CD players) package on September 22, 2017. The set contains both the stereo and mono versions of every song, all newly remastered by Bob Ludwig. Their Satanic Majesties Request — 50th Anniversary Special Edition will include Michael Cooper's original 3-D lenticular cover photograph, featuring the band in peak psychedelic regalia. Originally released in December of 1967, Their Satanic Majesties Request is the first self-produced album in the Stones' vast catalog. Experimental in nature, it was such a departure from the band's rhythm & blues roots that it threw critics for a loop. Initially derided by Rolling Stone Magazine for being "too infused with the pretentions of their musical inferiors" (namely the Beatles), the record was simultaneously lauded by DownBeat with a five star review declaring the album "a revolutionary event in modern pop music." The title was derived from a pun based on the inside of British passports at the time which read, "Her Britannic Majesties Principal Secretary of State for Foreign Affairs Requests and Requires . 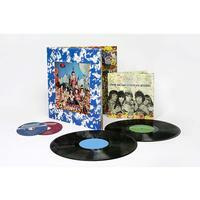 . ." Their Satanic Majesties Request was recorded in pieces between February and October of 1967. It was a tumultuous period for the Rolling Stones — Mick Jagger, Keith Richards and Brian Jones were arrested for drug possession, with Jones spending three weeks in a nursing home. The Stones' original manager/producer Andrew Loog Oldham quit halfway through recording sessions, leaving the band to finish the album on their own. A chaotic spring European tour that involved a riot in Poland also interrupted work flow. Very rarely were all five members in the studio at the same time but despite these impediments, Charlie Watts recalled, "The sessions were a lot of fun because you could do anything. It was so druggy-acid and all that." Grammy Award-winning music historian Rob Bowman writes in the liner notes for the new set, "Their Satanic Majesties Request should be recognized as an important stepping stone in The Rolling Stones' development from an r&b-inspired band to the inventors of modern rock for the 1970s." Falling between Between the Buttons and Beggars Banquet, it was the first of their albums to have identical tracklists in the U.S. and U.K. Satanic Majesties' 10 tunes are saturated with studio effects, non-traditional instruments such as mellotron and theremin, ambient sounds created using oscillators, string arrangements by John Paul Jones (who went on to help establish Led Zeppelin the following year) and more percussive devices than can be named. "Citadel" foreshadowed the direction towards straight-forward rock the Stones would take, while "2000 Light Years From Home" and "She's a Rainbow" (a minor hit in the U.S.) capture the band in all its psychedelic glory at that moment in time. They remain the only two songs from the album the band has ever played live. "Sing This All Together," its looser reprise "Sing This All Together (See What Happens)," "Gomper" and "On With the Show" transition from traditional song structure to free form freakout — a trademark of that era, also heard on records by the Mothers of Invention and Pink Floyd. Offered as a single just before the album's release, "In Another Land" is the only song in The Rolling Stones canon both written and sung by Bill Wyman, who took advantage of the fact that he was the lone member who showed up to the studio one day. The Small Faces happened to be recording next door, so Steve Marriott and Ronnie Lane were invited to contribute backing vocals, with Marriott also providing 12-string acoustic guitar. With Brian Jones on mellotron, Stones cohort Nicky Hopkins on harpsichord and Charlie Watts on drums, Mick and Keith laid down backing vocals, making it a complete Stones affair.